RemaPSP - Remap your PSP controls! Ever got annoyed at a PSP game because it had bad controls? Well be annoyed no more! RemaPSP is here to save the day! RemaPSP is a program to remap the PSP controls. It also supports turbo (Rapid Fire!) and Macros. You can remap any of your psp controls to any other. Including taking input from the remote. It works with Devhook and has a launcher for 1.5 homebrew. Change the controls around: Press X and the game thinks you are pressing LTrigger instead. 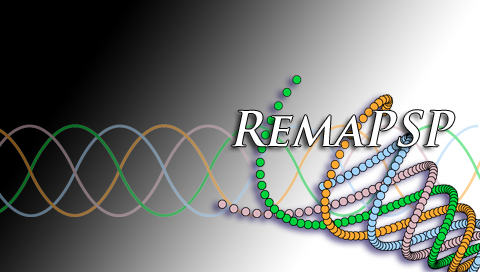 Do Macros: Push a button and RemaPSP pushes a combination of buttons over time that you have set up. Example: Press LTrigger in astonishia story and RemaPSP presses X, Down, X to skip the current persons turn. Do Rapidfire: Hold X and RemaPSP makes the game you are playing think you are repeatedly pressing it. Check the included readme for install, usage, modding instructions. I plan to release the source code later this week when I have some more time. Thanks to Haeal and Ayb4btu for the eboot art and to Lordsturm + Macca for their Beta testing help. Re: RemaPSP - Remap your PSP controls! im gonna try it out right now, THANKS!!! You sure can swap the digital and analog, there is even an example included to do it! Woops, forgot to post about using wordpad to open the files, thanks for the reminder, I'll add it to the first post. I tried my config then loaded gpsp, but it asked me for the BIOS, I thought I had to copy the BIOS to the RemaPSP eboot folder too but I got no different results, any advice for this? @Resso - I'm going to take a guess that gpsp uses argv/argc to work out where its running from. I haven't figured out how to pass these correctly to the homebrew I run so there are some homebrew out there that don't work. I've looked into but got no where, Maybe one of the shell authors around could drop me some code that does it successfully? 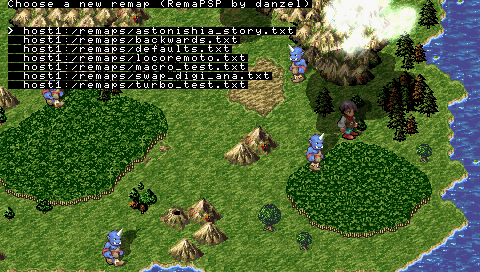 but I think there may be some situations that it is impossible for remapsp to work, or is it just a simple task? The unlaunchability of some programs is a problem with my launcher. However there is an alternative that Macca came up with before I had written the launcher! I find this program really usefull , more game support would be good (like gta (cheat? ),Me & my Katamari,007 From Russia With love,Socom(to get online quickly .... So it would be good to see a website with all the user-made remap.txt..
WOW I really took my time to notice you're the creator of AFKIM!